Don’t worry about getting the wrong gear again with our new Gift Cards! Buying for production enthusiasts can be a daunting task with the amount of varieties, options, compliance codes, sizes, and more to choose from. With the addition of our PMI climbing and rope access products, there’s also a seemingly endless option of carabiners, pulleys, and hardware to sift through. Save yourself the headache and a potential item return with convenient gift cards eligible at Mountain Productions Rigging Shop. Our gift cards are available in $10, $25, $50, and $100 amounts. Upon purchasing, we will send you an email to your digital gift card with a promo code that is redeemable at checkout. There’s no additional processing fees either. Grab that last-minute holiday gift today and let them choose what their next favorite piece of gear will be for 2017! Head on over to Mountain Productions Rigging Shop today to get the gift that’s always right! Happy Holi-DEALS from Mountain Productions: Enjoy 15% off! As the holiday season approaches, we want to make getting the perfect gift easy and exciting. Whether you’re buying for someone else or treating yourself, we hope that an extra 15% off of our already unbeatable prices helps you to get the gear you and your loved ones deserve! If you’re in the market for a new pair of gloves or want the best price on an industry-leading harness, you’ll want to be sure to check out our full line of fall protection and safety gear being offered. Last week we announced the launch of a brand-new product line from Pigeon Mountain Industries (PMI) on Mountain Productions Rigging Shop (click to read article). 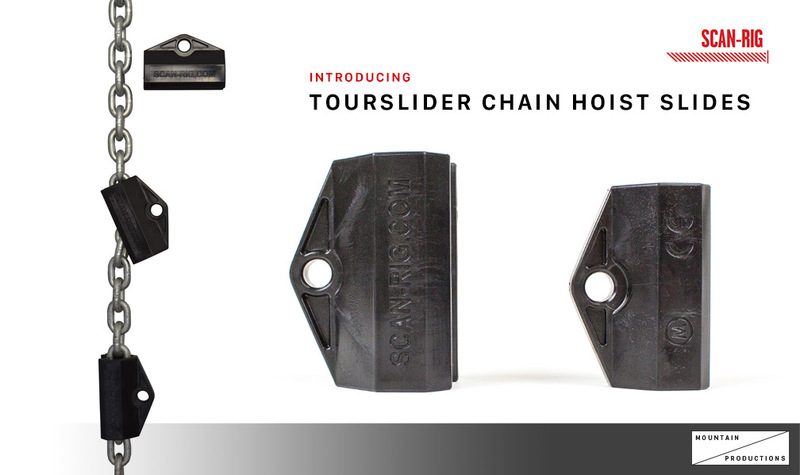 We’re just as excited to now offer Tourslider Chain Hoist Sliders! Mountain Productions is the exclusive dealer for the Tourslider Chain Hoist Slides, joining up with our friends in Sweden at Scan-Rig to sell their innovative chain slides to the US market. Chain hoist sliders are extremely popular in production, providing a simple way for cable management when operating electric chain hoists. The Tourslider is an excellent chain slide with an extremely simple installation. We’re excited to announce the addition of Pigeon Mountain Industries (PMI) rope access, fall protection, and safety products to our inventory! You may have seen some new PMI products on our Rigging Shop over the holiday weekend, and now that the turkey has digested and Thanksgiving is behind us, we’re ready to hop into the holiday gift season with full force! For some of us, going to a conference, meeting, or any group session can be intimidating. Networking can be a chore and somehow always seems awkward at first. What do I say? How do I react? When should I approach someone? Although it may be against your normal instincts to throw yourself out there and meet as many people as possible, it is one of the best ways to get the most out of every group experience in your professional career. Our CM Hoist School is rapidly approaching. This training seminar provides a lot of benefits, including high quality-training from industry-leading instructors and exclusive sessions with representatives from the brands of gear we use every day in the field.